The blues are past the heel turn; one is past the gusset decreases and the other is just starting them. 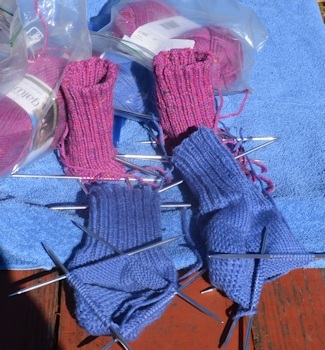 Behind them, the rose pair has completed the ribbing on one sock, and has a row or two to go on the other. They will wait until I finish the gusset decreases on the blue pair and then proceed slowly while the blues charge ahead to finish (I hope!) by the end of the month. However, there's other work to be done (the annual report on our wildlife management project), plus revisions requested by Editor when they come in, plus work around the house beyond daily chores. Last year's sock total was 2 pairs of regular socks for a friend, 8 pairs regular socks for myself, and 7 pairs short socks for myself. 17 pairs total. I hope to finish 1, 7, and 7 this year, and do my first pair of fingerless mitts. Anyone who wants to see all the sock pairs done last year can check on my Ravelry projects page. Socks are my favorite carting around and working on project when I am running around and hurrying mup to wait. :) Meanwhile, where can we find your schedule for 2016? I am hoping there is something I can manage this year! We thoroughly enjoyed you, too! I bragged on your socks to some sundry. Including how much I enjoy you and Robin McKinley influencing each other, being creative, trying new [& old!] things, & being friends. If I ever grow up [use of subjunctive tense to indicate hypothetical or unreal situation], I want to be you two. Blue socks finished in the evening of January 19. While I was working on them, an email came in (I didn't hear it ding) telling me a long-ago friend was in hospice and expected to die within 24-48 hours. We were no longer close, but...still. That's why I'm up this far into January 20. I can't just go to sleep, and yet tomorrow I have work to do.